The 2010 Drum Corps International World Championship Semifinals in Indianapolis found the Academy just a half a point out of 13th place, followed by the Troopers, a corps that had finished 12th just the year before. For the fourth time in six years, Colts had to settle for that unenviable 13th-place position in the Semifinals, just one spot away from the top 12 corps that advanced to the Finals. Colts' show, "True Colors," played directly off the title, with bright flags painting luminous swatches against pure white color guard costumes. The colors on the field changed to interpret each piece of music, conveying the spirit of the lyrics to the song that gave the show its title: "I see your true colors shining through / So don't be afraid to let them show / True colors are beautiful, like a rainbow." The production began with "Green (Verdant Music)" from the 1986 album, "Color Music," composed by post-minimalist Michael Torke. Post-minimalism came after the pioneering repetitive pure minimalism of composers such as Philip Glass, Steve Reich and Terry Riley, adding several dense layers of musical texture, typically creating a bubbling cauldron of melodies and rhythms that force one to listen to a variety of motifs at once. Each selection on the album featured a different color, centered on a different key as "heard" by Torke. While most people ponder the "color" of music as being a fairly abstract concept, Torke has a neurological condition named synesthesia, meaning he literally hears each key (tonal center) as a different color. "Green" was punctuated by spontaneous jazz rhythms and luminous timbres, featuring lime green flags and the musicians of the corps wearing a tassel of the same color draped over their right shoulders. Kelly green rifles and sabers were later added to the mix, culminating in a dense critical mass of musical colors. The color blue took over during the hypnotic repetitiveness of "Alone in the Crowd" and "One Man Show" from Jeff Beal's soundtrack to the 2000 film biography "Pollock." The film explored the artistic vision and self-destructive behavior of Jackson Pollock, creator of the "drip painting" technique. The music captured the agitated chaos of Pollock's work, which expressed the joy of colors for the mere sake of color itself. One somersaulting and back-flipping color guard member introduced blue to the field with his jacket, soon followed by sky blue flags. The show's title song was "True Colors," the 1986 number one pop song written by Billy Steinberg and Tom Kelly. It was also the title track from Cindi Lauper's second album, her last song to hit the top of the U.S. Billboard Top 100. Flags comprised of various shades of orange filled the field during a rather laidback interpretation of the tune that built up steam and then died back down to a relaxing conclusion. The final musical selection was the classical/bluegrass Americana of Paul Halley's "Appalachian Morning." The song came off the 1990 Paul Winter Consort album, "Earth: Voices of a Planet," commissioned for the 20th anniversary of Earth Day. Halley played keyboards in Winter's ensemble until 1999, winning five Grammy Awards for his work as composer and performer with the band. The group was known for highlighting musical styles of different cultures and utilizing instruments of many countries. The field became bathed in a sea of deep pink flags until the final big musical push. At this point the color guard members picked up solid white flags to end the show with a clean palate, like refreshing one's breath with a mint after enjoying a spicy meal. For this week only, you can save on the DVD that contains this complete Colts performance, along with all corps from Volume II of the 2010 DCI World Championship DVD set. 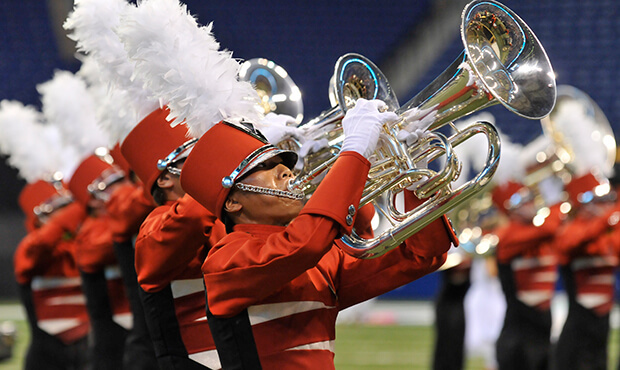 Buy the 2010 Volume II DCI World Championship DVD (Available this week only for 20% off. Regular price: $35.95.) DVD discount offer ends Monday, November 24, 2014.